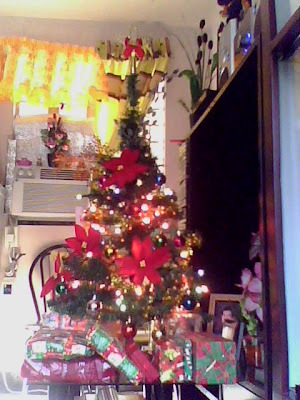 Home Christmas Christmas 2010 Christmas decors Christmas Flower Christmas star christmas tree Five-pointed Star gifts invasion of our home pine trees Poinsettia Red Christmas Tree Our Red Christmas Tree! I would like to share with you our Christmas Tree erected in our home. A very beautiful Christmas tree! As you can see, it is a red Christmas tree! It's because red dominates the totally of the Christmas tree. 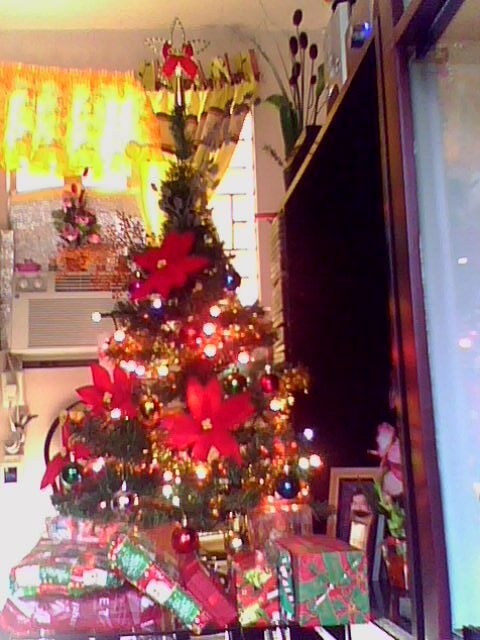 It is decorated by the red Christmas flower poinsettia! This red Christmas flowers were blooming in our pine tree! 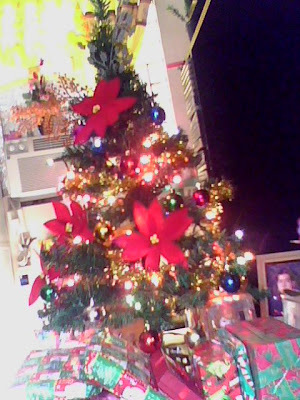 Even the red star on top of our Christmas tree has a red ribbon on its center! Besides the red Christmas flower poinsettia and five-pointed Christmas star on top, other Christmas decorations surrounded our Christmas tree. Christmas balls with different shinning colors, glossy silver and bronze leaves, gold sash, and colorful Christmas light were some of the accessories which give life and fun to our Christmas tree! We prefer to use a steady Christmas light rather than the blinking one to make our Christmas tree more solemn! It's such a silent night when you're beside it! Of course under our Christmas tree are lots of gifts! Yup, these gifts were combination of those I received and those to be given away!